With your support I bicycled all 560 miles between Ft. Mason, San Francisco, and Century City, Los Angeles, raising over $4400 from more than 30 people to help AIDS treatment and prevention. The Ride was an amazing experience, both physically and emotionally. The training was long and hard; I'd never ridden more than 50 miles in a day before, and I needed to be able to go as much as 100 miles per day, day after day. My training took me around the Silicon Valley, from the flat valley floor up into the mountains that separate us from the ocean. Obstacles appeared, however: on a ride at the end of March I allowed myself to go too quickly down a windy mountain road. I couldn't see around the corner until it was too late, and found myself moving too fast to navigate a hairpin turn. My wheels went out from under me, and I ended up with a broken collarbone and shoulderblade (and a mangled bicycle). This taught me a very important lesson about appropriate speed when you can't see around the next bend, and the doctors promised 4-6 weeks recovery time to ponder this lesson. I couldn't give up, however, as the organizers of the AIDS Ride had chosen "Never Give Up" as their motto this year (go figure!). I already had T-shirts and posters emblazoned "Never Give Up," so I headed off to the gym to continue my training indoors and standing still. 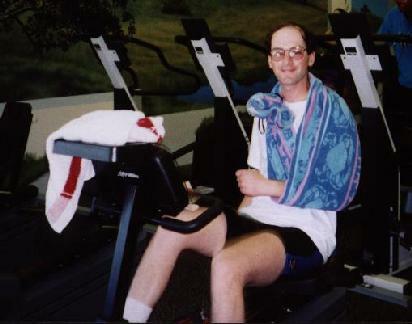 Working on a stationary bike proved invigorating but boring (I read many many books while sitting there pedalling), and I maintained a good level of fitness until I could finally return to a real bike just two weeks before the Ride. Given the sorry shape of my old bike and the still weak condition of my shoulder, I got a recumbent bicycle (see the attached pictures). 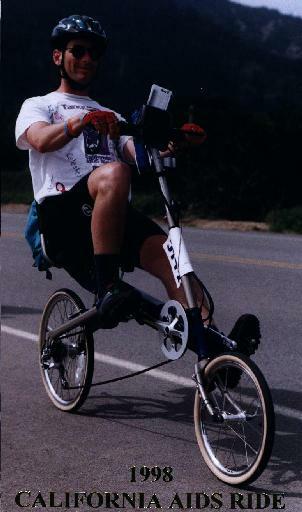 Recumbent bikes allow one to pedal while leaning back with one's feet out in front. It took a bit of getting used to, but put no stress at all on my shoulders and proved to be extremely comfortable on long rides. 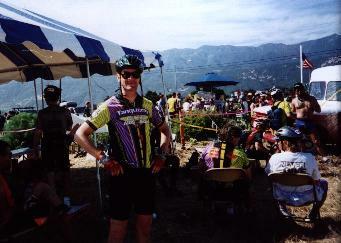 On the last day of May, after two brief weeks getting re-acclimatized to non-stationary biking, the 1998 AIDS Ride began. Starting at Ft. Mason, San Francisco (east of the Golden Gate Bridge), we were to ride 560 miles in seven days all the way to Los Angeles. Some have described this process as "Ride Eat Sleep, Ride Eat Sleep...", but it might more accurately be described as "Wake at 5 or 5:30am, pack up your tent and gear, wait in line for breakfast, ride, eat, ride some more, drink a lot to keep from getting dehydrated, ride, wait in line for a porta-potty because you drank too much, ride, eat, ride, eat, ride, fix whatever's wrong with the bike, ride, ride, ride, ride some more, ride into camp, set up your gear and tent, and collapse after dinner..." The physical demands of getting from one campsite to the next were stiff, 90 miles on day one, 100 miles the next day, followed by 82 miles, 70 miles, 55 miles, 94 miles, and finally 67 miles. The shorter days tended to be hillier and hotter, and on all but the shortest day it took me most of the allotted time to get to the evening campsite. 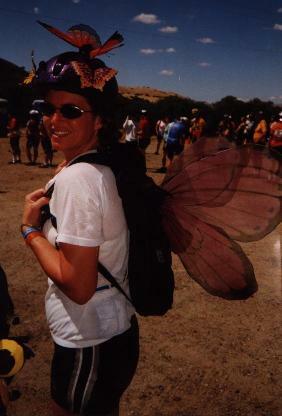 In general I was fit enough for this, though my knees gave my trouble thanks to overtight "IT Bands." These bits of tendon that had never before made themselves known to me, but after all this riding they decided to protest by knotting up and trying to move my kneecaps to a new location. With the help of P.T.s taping my legs and plenty of motrin, however, I was able convince my kneecaps to stay put and to keep the soreness within reason. I was far from the fastest rider, but I wasn't at the back of the ride either, and I was able to pedal up every hill along the route. The physical challenge of the ride was amazing for me, but I found the people on the ride even more amazing. There was somewhat of a carnival atmosphere, with many people dressed in costumes (such as one woman who dressed like Wonder Woman, complete with golden lasso and "I'd rather be flying my invisible airplane" bumper sticker), or with their bikes and helmets decorated with dolls, stuffed animals, squeaky toys, spinning propellers, or whatever their imaginations could come up with. Some were overcoming disabilities: one man, missing one leg and part of the other, was pedalling a special bike with his hands. A woman, missing part of one leg due to a drunk driver, rode with a prothesis. More than a hundred HIV positive people were riding, rejecting the shame that some place on the disease by proclaiming their status with bright orange flags. Some people rode in memory of brothers, sisters, parents, and children, memorial pictures on the bikes. 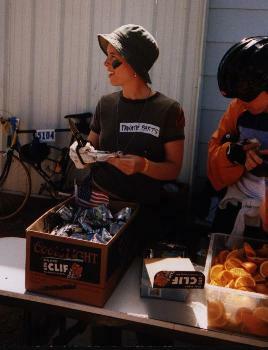 The riders were always offering help to one another, fixing a flat tire, setting up tents, or getting up hills: after reaching the top of the long hills on our route, the strongest riders would come back down cheering people on, and ride back up again, talking, encouraging, and even pushing those having trouble with the hill. Some of these strong riders climbed steep hills five or more times to help the rest of us get up. The riders weren't the only amazing people; in addition to over 2600 riders, there were more than 600 crew members to help make sure we had food, water, and that our gear and tents made it from one camp site to the next. A large group of UPS drivers took a week without pay to drive the support trucks. A team of paramedics, doctors, and nurses, cruised up and down the route in ambulances, playing music over the PA system (usually disco on the long hills, and once the theme song to "Chariots of Fire"). And along the way there were lots of people cheering us on. Even out in the middle of nowhere, we'd come across people sitting on the side of the road cheering and applauding us as we went past. In some places, gas stations refused to charge for fuel for our gear trucks, and some restaurants gave riders and crew free food. The route we took paralleled US Route 101 for the most part, though sometimes we followed California Route 1 instead. 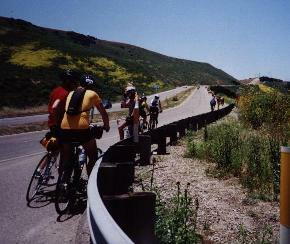 On the first day we rode south through San Francisco, then over the hills to the coast and south to Santa Cruz. San Francisco was quite a party, even though we were riding out around 7am. They mayor himself led the procession, and the streets were lined with revelers cheering us on. The coast was much more spare, with clouds, mist, and the mountains coming right down to the ocean. We followed the coast all the way to Santa Cruz, going up along rocky cliffs and then down past tiny coves and beaches pounded by the open ocean. 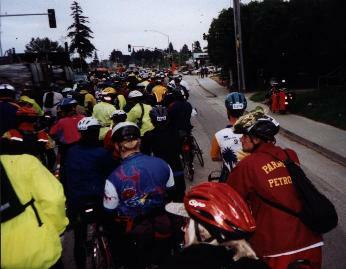 The second day, Monday, got off to a slow start as we headed out of Santa Cruz with heavy rush-hour traffic, bicycles stretching solidly from one traffic light to the next. 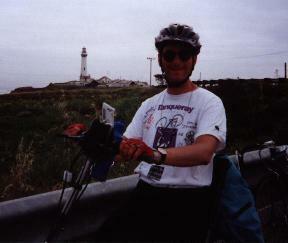 We continued along the coast as far as Moss Landing, then turned inland through Salinas and along a long, narrow valley. The valley seemed to stretch forever in front and behind, farms on the valley floor, and tall mountains on either side. The morning's late start proved something of a blessing, however, as I reached the start of the valley just as the afternoon winds were picking up. With the ocean at one end of this valley, the heat of the day draws heavy winds up the valley each afternoon. These winds propelled me along almost as if I were flying, making the days 100 miles to King City go past easily. Day three, from King City to Paso Robles, found us further inland in a hotter, more arid, area, with rangeland and fallow fields of wildflowers replacing the croplands of the day before. 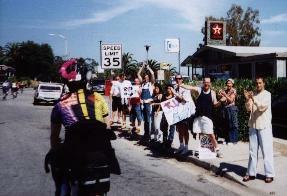 One pit stop was held in the parking lot of an Army firing range, and the pit crew dressed in fatigues with names like General Purpose, Corporal Punishment, and Private Property (this same crew held a beauty contest the next day, dressed up with names like "Miss Conception," "Miss Appropriate," and "Miss Ogyny"). By the lunch stop it was very hot and dry, and we had to drink continually to avoid dehydration. Things got tougher near the end of the day, when a flooded road gave us a detour and 5 extra miles, mostly into a strong head headwind. That night I ended up eating in a local diner, enjoying the novelty of food and drink brought to my table, under a roof instead of a tent. Day four started with clouds and turned into rain as we climbed through the coastal range back toward the ocean. The climb was long and hard in the rain, and at the top the peaks were enshrouded in the midst as we began our 5 mile descent down to the ocean. That morning I'd noticed that a crucial part had fallen off my bicycle pump, rendering it useless. What should happen, then, but that I got 2(!) flat tires on the ride down to the ocean. One advantage of such a large ride, though, is that it's only a matter of minutes before some one with a pump comes along. In one case it was a fellow rider, in the other it was Derek, a member of the support crew with a car full of bike tools. Derek seemed quite amazing for his ability to appear right when people needed him. He did the same thing again for me two days later when I got another flat. Perhaps he was "beaming" in? The route then passed through Morro Bay, marked by a spectacular granite pinnacle rising up out of the water. From there we followed the coast through Pismo Beach and eventually to Oceano, where our camp site was at the airport, our tents on either side of the runway (luckily closed for the evening). The fifth day, from Oceano to Lompoc, was the shortest (at only 55 miles), but also had some of the most challenging hills as we moved inland again. The first came only 3 miles into the ride, and was short (about three blocks long), but about as steep as could be - my legs were really burning as I got to the top. That was followed by rolling hills until about mile 30, where we came to the first of three longs hills (2-3 miles long each). The first was straightforward - you could see the top and it wasn't too steep. The second hill was very long and windy, so at each bend we wondered, "Are we there yet?" The third hill was the toughest: steep, with a strong headwind for the first half, changing to a strong crosswind in the middle. Still, the day was short and I got into camp reasonably early, but as soon as I could get myself showered and fed I collapsed into bed. Day six was another long day, more than 92 miles. It marked our final return to the coast, with a long gradual climb through agricultural lands into the coastal range, followed steep descent to the ocean north of Santa Barbara. We lunched on the campus of UCSB, a very pretty place between the ocean and the mountains. From there we followed the coast all the way to our campsite on the beach in Ventura. The final day was 65 miles, following the Pacific Coast highway from Ventura through Malibu and finally down the streets of Los Angeles to Century City. My only knowledge of Malibu before had been hearing news reports of houses falling in the ocean. Now I know why: all the houses there are either perched precariously on very steep hillsides, or else build on stilts over the beach. The ocean and beaches were very pretty, though. Then we moved into the city itself, eventually reaching the holding area on the back lot of the Fox Studios. While we waited for all the riders to arrive, they held a party for us in a very convincing replica of a run-down New York neighborhood. Once all were present, we had a victory procession taking up all eight lanes of the Avenue of the Stars in Century City. Finally assembled, we all danced holding our bikes above our heads, amazed at what we had just completed. Walking around Los Angeles afterward, I was quite astonished by the fact that I'd made it all that way under my own power. I wondered what other great tasks we might all accomplish simply through dedication and focus. Thank you again for your support. 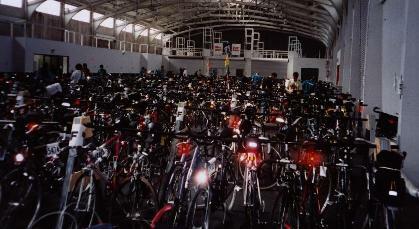 The ride as a whole raised more than $9.5 million. 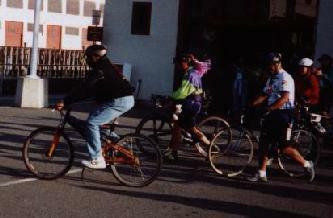 This money will significantly increase the number of available AIDS treatment spots in San Francisco and Los Angeles clinics (proceeds from the 1997 ride increased the spots by 1/3), provide expensive treatments for those who can't afford them, as well as extending a number of outreach programs that slow the spread of AIDS. Your donation is making a difference.